Go to original pattern for design DROPS 156-37. Knitted DROPS jacket worked in a circle in garter st with lace pattern in ”Big Merino”. Size: S - XXXL. DROPS DOUBLE POINTED NEEDLES AND CIRCULAR NEEDLE (40 and 80 cm / 16'' and 32'') SIZE 5 mm / US 8 - or size needed to get 17 sts x 22 rows in stockinette st = 4'' x 4'' (10 x 10 cm), or 17 sts x 33 rows in garter st = 4'' x 4'' (10 x 10 cm). DROPS CROCHET HOOK size 4 mm / G/6 - for button loop. 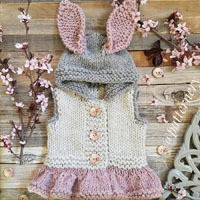 You can get the yarn to make this pattern from	63.00$. Read more. See diagrams A.1-A.3. The diagrams show all rows in pattern seen from RS. Inc 1 st by making a YO. On next row work YO twisted (i.e. work in the back loop of st instead of front) to avoid holes. 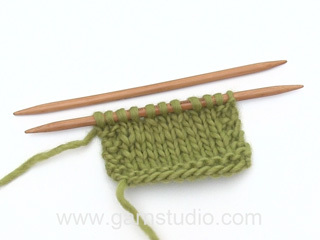 Cast on 7 sts with Big Merino and divide them on 4 double pointed needles size 5 mm / US 8. K 1 round while AT THE SAME TIME K 2 sts in every st = 14 sts. Insert 7 markers in the piece, 2 sts apart. 1st marker = at beg of round = back of neck. P 1 round. On next round K while AT THE SAME TIME working 2 sts in every other st = 21 sts. P 1 round. On next round K with 2 sts in every 3rd st = 28 sts. P 1 round. Then work according to A.1, work 1 repetition over the 4 sts between every marker. When A.1 has been worked, continue according to A.2. After A.2 continue pattern in A.2 the same way with 7 inc on every other round, work the inc sts in pattern. Switch to circular needle size 5 mm / US 8 when needed. REMEMBER THE GAUGE! When piece measures 17-18-19-20 cm / 6 3/4"-7"-7½"-8" from middle, work 3 ridges in GARTER ST – see explanation above - over all sts. NOTE! Continue inc every other round, inc with a YO after every marker (= 7 inc). Work next round as follows: Work 25-27-29-31 sts, bind off 32-34-37-40 sts (= armhole), work until 57-61-66-71 sts remain on needle, bind off 32-34-37-40 sts (= armhole) and work 25-27-29-31 sts. P 1 round - AT THE SAME TIME cast on 32-34-37-40 new sts over each armhole, same no of sts that were bind off for armhole. Work 4 ridges. Continue with A.2 and inc for 4-5-7-9 cm / 1½"-2"-2 3/4"-3½", work 5 ridges with inc, work A.2 with inc for 13-16-18-20 cm / 5"-6 1/4"-7"-8", finish with 5 ridges with inc – piece measures approx. 45-50-55-60 cm / 17 3/4"-19 3/4"-22"-23½" from middle and outwards. LOOSELY bind off. The sleeve is worked back and forth on circular needle. Cast on 44-46-48-50 sts (includes 1 edge st in each side) on needle size 5 mm / US 8 with Big Merino, work 3 ridges in GARTER ST - see explanation above (= 1st row = WS). Work next row as follows from RS: 1 edge st in garter st, A.3A (= 2 sts) A.3B until 3 sts remain, finish with A.3C (= 2 sts) and 1 edge st in garter st. When piece measures 17 cm / 6 3/4'', work 3 ridges. Then work in stockinette st with 1 edge st in garter st in each side – AT THE SAME TIME on next row from RS inc 1 st in each side – read INCREASE TIP, repeat inc every 3½-3-2½-2 cm / 1 1/4"-1"-7/8"-3/4" 9-10-12-15 times in total = 62-66-72-80 sts. 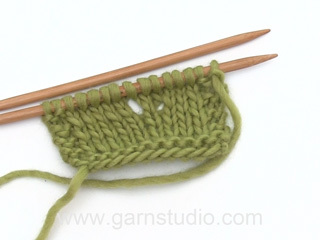 When piece measures 52 cm / 20½" in all sizes, bind off for sleeve cap at beg of every row in each side as follows: 5 sts 1 time, then 2-2-3-3 sts in each side until piece measures approx. 60 cm / 23½'' - NOTE! For size XL-XXL bind off 3 sts only 6 times in each side, then 2 sts. Bind off the remaining sts. Sew the sleeve seams inside 1 edge st. Sew in the sleeves so that middle of sleeve cap is placed where armholes are the closest tog (i.e where 1st st was dec for first armhole and where last st was dec on second armhole) and sleeve seams are placed where the armholes are the furthest apart (i.e. in opposite side - see chart). Lay the jacket down as shown in chart with RS up and sleeves straight out, sew button in the left side under sleeve from RS. Crochet 1 buttonhole loop on hook size 4 mm / G/6 in bind-off edge under sleeve in the right side as follows: 1 sc in bind-off edge on jacket, ch 5, skip approx. 1 cm / ½'' and fasten with 1 sc in bind-off edge. 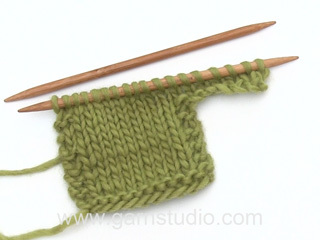 Also, can I knit the sleeves on normal pointed needles? 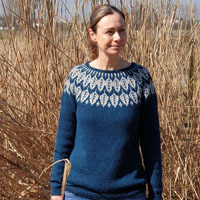 Why does the pattern ask for circular needles but knit back and forth? Could this be worsening the distortion? Thanks for your help again! 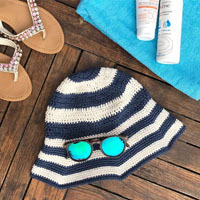 Dear Bernadette, the sleeves are knitted with circulars to have the number of stitches comfortably fit onto the needle, but, if you prefer, you can knit them on straights. However, I do not think that the type of the needle you are knitting with affects the distortion. Happy Knitting! I've ripped out the whole sleeve and started again with particular attention to tension. The stitches are neither increased not decreased but the distortion is still there. Please can I check that I've interpreted the pattern correctly? 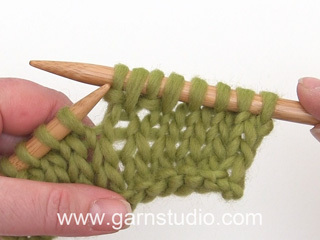 A3 is worked as follows: 1 edge stitch,knit 2 together (k2t) yarn over (YO), k2t, YO etc ending in k2t, YO, edge stitch. Knit row. 1 edge stitch, knit 1, k2t, YO, k2t, YO etc, ending in YO knit 1, edge stitch. Is that right? Dear Bernadette, sorry to hear you are still having troubles with the sleeve. 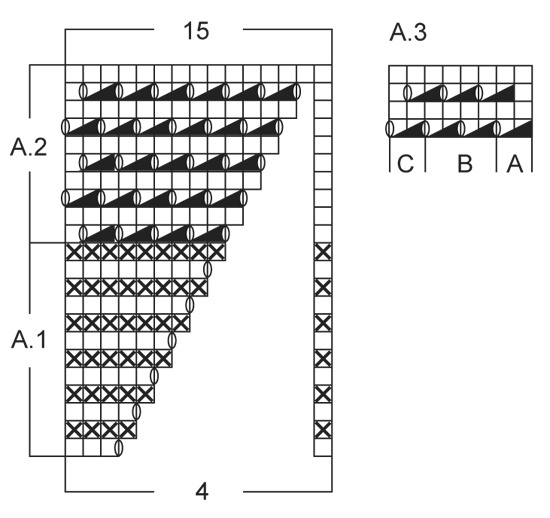 You read the pattern correctly, however the second row is a purl row (from the wrong side, the diagram shows every row from the right side). And please do try to block the piece out (wet and pin into shape, then let it dry). I hope this helps. Happy Knitting! Prosím o radu - nedaří se mi při nahození 7 ok na ponožkové jehlice vytvořit úplet bez díry uprostřed. Přitom u všech návodů modelů pletených touto technikou vidím fotky zad bez sebemenší dírky a beze stopy sešívání... Jak na to? Neexistuje nějaký videonávod? Please help! I have completed the main body of the garment, which is fine. However the sleeves are completely out of shape - it looks as though there is a consistent increase on one side and a decrease on the other! I don't think it is the tension. Rather than a rectangle, it looks like a parallelogram! The pattern looks right and I have definitely not added or dropped any stitches. When I fold in two to stitch together, the seams don't match. Dear Bernadette, the sleeves should be more or less symmetric, when folded. 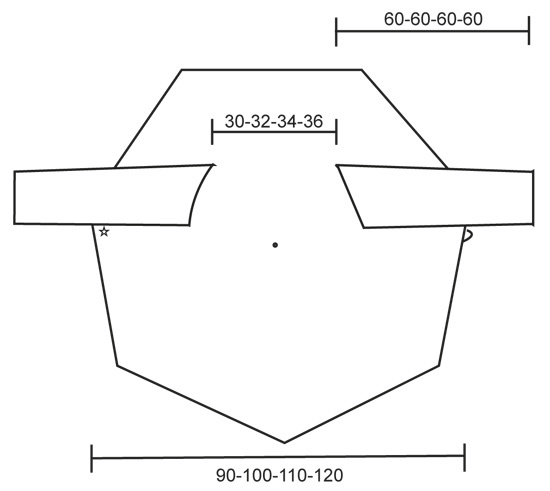 Granted that the ajour pattern has a tendency to slightly distort the shape, but if you look at the dieagram, there is equal number of decreases and increases, the number of stitches do not chnage. Try to wet-block the piece and pull it into shape, while it is wet. I hope this helps. Happy Knitting! After casting off and then on again to make the armholes, do I YO after every 7 markers as previously? The pattern doesn't say to do this. Also when casting off, the pattern says that 57 stitches should remain "on the needle". Is this a mistake? (Circular needles are being used here. Does it mean ' 57 stitches should remain AT THE END OF THE ROW? The wording is very unclear! Dear Mrs Buckley, correct, 57 sts should remain before end of round, then continue pattern as before with YOs to inc circle. Happy knitting! Chart A2 has YO at the beginning and end of each repeat. This is 2YO next to each other. Working the following row, you lose one of the YO and end up not increasing and one big hole. Could you please explain how to work this to stay in pattern and keep the increase? Dear Anne, diagram A.2 starts with K1 on every round (first st in A.2 = white square in the column at the right side). Read more about diagram here. Happy knitting! Liebe Kerstin, dann wählen Sie am besten die Grösse, die Sie üblicherweise tragen. Die Zahlen sind die cm-Angaben an der Stelle, an der sie eingezeichnet sind. Vielleicht kann Ihnen jemand beim messen helfen.